Once you have created an invoice in TheraNest you can instantly submit them to the clearinghouse. Once the clearinghouse receives your claims, they are scrubbed for errors. TheraNest can do a general check for errors before your claim leaves the system. However, your clearinghouse can check for errors that are specific to your payers. If your claim has been rejected at the clearinghouse, it will not be forwarded to the payer. TheraNest is not able to see if your claims have been rejected, so it is essential to check on the status of your claims with the clearinghouse. If your claim has been rejected, it will need to be corrected and resubmitted. Here is an article that contains some common claim rejections and how to fix them in TheraNest. If you are having trouble correcting your claims we are happy to help you troubleshoot the problem. Just complete the Claim Research Form below with the details of the rejection. 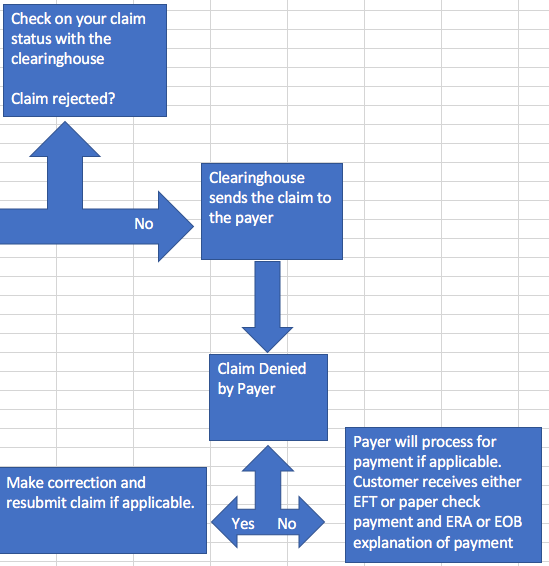 If your claim is "clean" free from errors, it will be sent to the payer. Claims can be submitted to the payer either electronically or by paper. Some payers require you to complete EDI enrollment paperwork before they forward your claims electronically. Be sure to check with your clearinghouse to see if EDI enrollment is required by any of the payers you work with. Once your claim is received, the payer will process it. Depending on the denial reason you can correct and resubmit the claims, or appeal. In some cases a denial is expected, such as for a non- covered service. If your claim is paid, the payer will send you notification of this either by EOB or ERA. They will pay you either by paper check or EFT, depending on what your agreement is with that payer. TheraNest can upload any ERA's that are available on your clearinghouse's server. Check with your clearinghouse to see if they can receive ERA's from your payers. Once you are receiving ERA's in TheraNest, you post them to your client's ledger by following the tutorial above. Check out our Billing E-Book below to learn more about the Billing Process.